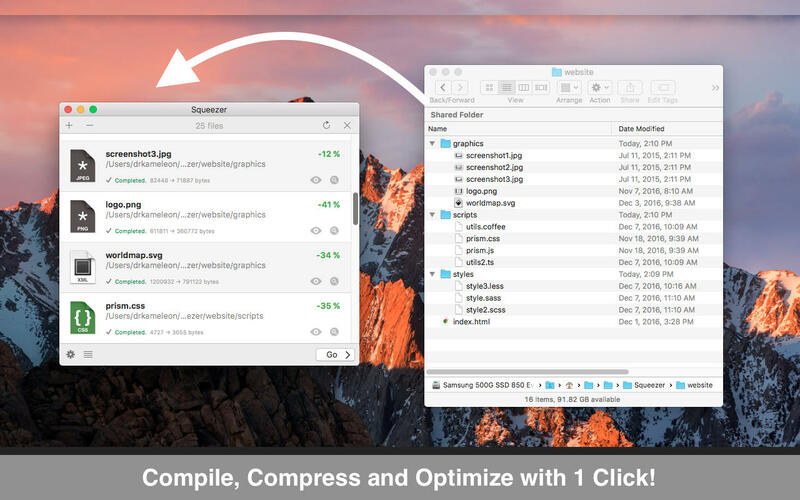 The absolute all-in-one minifier/compressor/compiler for Mac. Tired of having to compile your scripts manually? Do you want to optimize your website images? Do you really want to speed up your website by shaving off unnecessary file bulk? Just drag'n'drop your files and Squeezer will take care of the rest! - Batteries-included: You don't need to install anything. It just works. Afrikaans Bilingual Dictionary - by Fluo! Albanian Bilingual Dictionary - by Fluo! Arabic Bilingual Dictionary - by Fluo! Armenian Bilingual Dictionary - by Fluo! Basque Bilingual Dictionary - by Fluo! Bulgarian Bilingual Dictionary - by Fluo! Catalan Bilingual Dictionary - by Fluo! Chinese Bilingual Dictionary - by Fluo! Croatian Bilingual Dictionary - by Fluo! Czech Bilingual Dictionary - by Fluo! Danish Bilingual Dictionary - by Fluo! Dutch Bilingual Dictionary - by Fluo! Esperanto Bilingual Dictionary - by Fluo! Estonian Bilingual Dictionary - by Fluo! Finnish Bilingual Dictionary - by Fluo! French Bilingual Dictionary - by Fluo! Georgian Bilingual Dictionary - by Fluo! German Bilingual Dictionary - by Fluo! Greek Bilingual Dictionary - by Fluo! Hebrew Bilingual Dictionary - by Fluo! Hindi Bilingual Dictionary - by Fluo! Hungarian Bilingual Dictionary - by Fluo! Icelandic Bilingual Dictionary - by Fluo! Irish Bilingual Dictionary - by Fluo! Italian Bilingual Dictionary - by Fluo! Japanese Bilingual Dictionary - by Fluo! Korean Bilingual Dictionary - by Fluo! Latin Bilingual Dictionary - by Fluo! Latvian Bilingual Dictionary - by Fluo! Lithuanian Bilingual Dictionary - by Fluo! Malay Bilingual Dictionary - by Fluo! Norwegian Bilingual Dictionary - by Fluo! Persian Bilingual Dictionary - by Fluo! Polish Bilingual Dictionary - by Fluo! Portuguese Bilingual Dictionary - by Fluo! Romanian Bilingual Dictionary - by Fluo! Russian Bilingual Dictionary - by Fluo! Serbian Bilingual Dictionary - by Fluo! Slovenian Bilingual Dictionary - by Fluo! Spanish Bilingual Dictionary - by Fluo! Swahili Bilingual Dictionary - by Fluo! Swedish Bilingual Dictionary - by Fluo! Thai Bilingual Dictionary - by Fluo! Turkish Bilingual Dictionary - by Fluo! Ukrainian Bilingual Dictionary - by Fluo! Urdu Bilingual Dictionary - by Fluo! Vietnamese Bilingual Dictionary - by Fluo! Welsh Bilingual Dictionary - by Fluo!